Just like humans, dogs need to have their teeth taken care of. Teeth are an important part of a dog’s health to maintain and yet 4 out of 5 dogs over the age of 3 have gum disease, which suggests that thorough dental care in dogs can often be overlooked. Gum disease is caused by a buildup of plaque and tartar around the gum line. If teeth are not routinely cleaned, buildup can result in gingivitis, bad breath and potential tooth loss. Dental work can often be very painful, both for the dog and for the owner’s bank balance, but brushing your dog’s teeth is a great way to reduce the risk of gum disease and can also be a fun activity. Toothpastes can come in a variety of flavours including meat, broth and salty and can be bought from your local vet clinic or pet shop. Our Head Vet Sean recommends ideally cleaning your dog’s teeth every day, or at least a minimum of 3 times a week. Get your dog used to the idea of invading their personal mouth space by lifting their lips and opening their mouth to look at their teeth. If you reward your dog with treats or affection, they will soon become more relaxed. Put some of your dog’s toothpaste on your finger and get your dog to lick it off. Your dog will most likely enjoy the flavour. This is a good way of getting them used to the toothpaste before the regular teeth brushing begins. 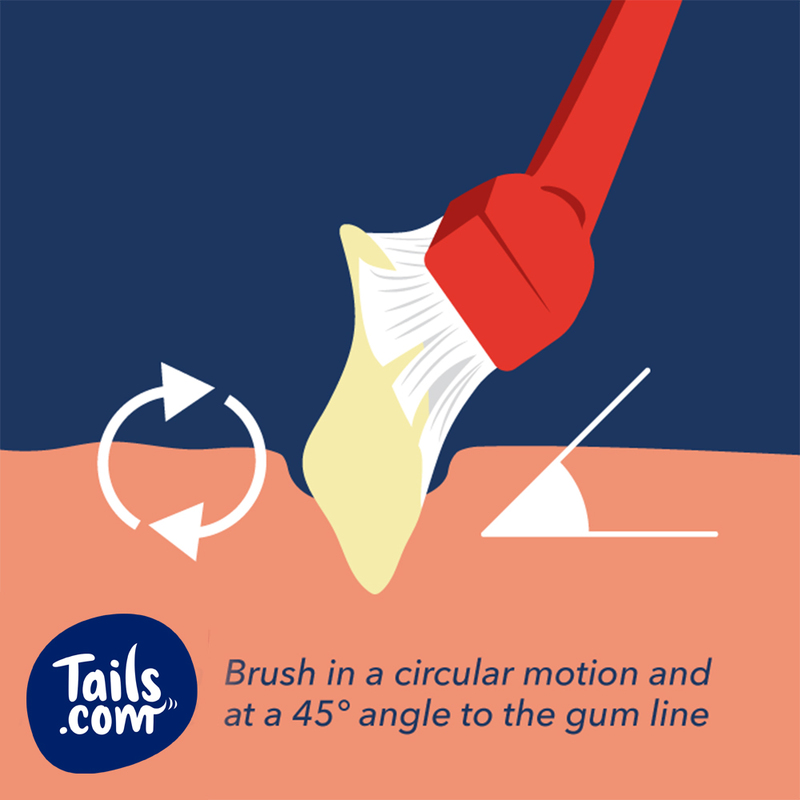 Put the toothpaste on the brush and angle the bristles at a 45 degree angle against your dog’s teeth. This will ensure that you massage the gum line. This is a key focus. The majority of plaque accumulates on the outer surfaces of all the teeth. Brush here first to remove plaque from your dog’s teeth. Brush in small circles to reach where the gum meets the teeth. If a slight bleeding occurs, don’t worry – this should improve with time as the gums become used to brushing. Once teeth cleaning becomes a part of your dog’s weekly routine, they’ll will get used to doing it regularly. Start off slow and start with only brushing a few teeth and build up gradually to brushing more each time. After you’ve built up, each session should ideally last about 2 minutes. If your dog appears to be agitated, stop and try again later. It can be a fun activity and shouldn’t have to be a daily chore or struggle! Use plenty of praise, excitement and treats as a reward for co-operation. In addition to dental hygiene care, our Dental Dailies can help to remove any plaque and tartar that has built up over time as well as doubling up as a great treat. How can I help my dog’s arthritis?